Since the mid-1990s, political, legal, and historical debates about Nazi theft and confiscation of property, the use of slave labor during World War II, and restitution and compensation have reemerged. 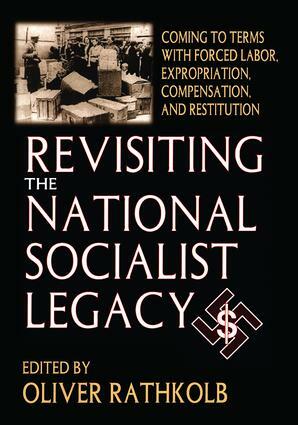 Revisiting the National Socialist Legacy presents completely new historical research on these issues conducted worldwide.This volume responds to concern about Holocaust era assets in Europe, the United States, and Latin America. It focuses on both reexamination of the history of National Socialist property theft and employment of forced labor in the wartime economy, and the compensation and restitution solutions advanced in various European and Latin American countries since 1945. While the question of Nazis in exile and the memories of survivors are explored, attention is focused on the role of numerous historical commissions and the tension between judicial processes, media coverage, historical scholarship, and politics.The book is divided into five parts: "At the Nexus of Justice, Media Coverage, Historical Scholarship and Politics"; "Commissioned History"; "Research on Slave and Forced Labor"; "National Socialist Theft: Banking, Industry, Insurance and Works of Art"; and "History as Catharsis." History as Catharsis: Coming to Terms with the Nazi Past in Brazil, Chile, Argentina and Austria - A Comparison. Oliver Rathkolb is Professor of Contemporary History at the University of Vienna, Austria.